Indexing is the process of creating records of programs and other files on your Windows computer. It helps to fetch search results faster using Microsoft OS search. Indexing process consumes a portion of overall system efficiency. If you use the search feature very often on your laptop, it is better to keep the indexing active but if you don't care much about search speed, you can disable it. Disable indexing can improve the system performance a little bit more. Windows 7 is always looking for files to be updated to its index and it may reduce efficiency. If you are looking for a fast system search, you should not turn off this feature. If you are looking for performance and don't bother the speed of file search for a particular program or file, it is better you turn off indexing feature. If you do not know how to do it, I suggest you read the steps provided below. In order to turn off indexing in Windows 8 and 7 computers, you need to enable don't use the index in control panel. You can enable it by following the instructions below. 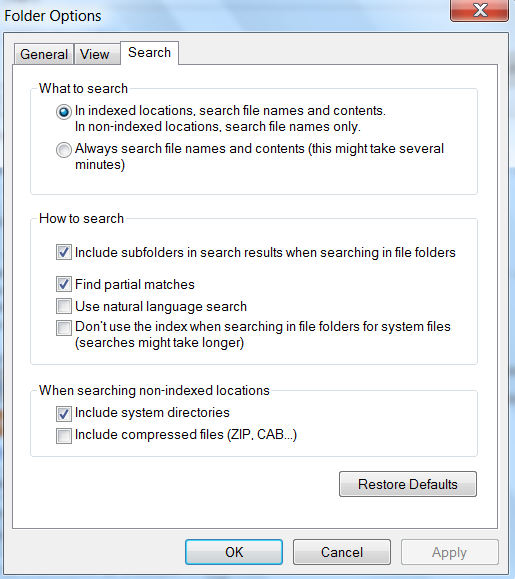 To turn off it in Windows 8 and 7 computer, you should check the checkbox of "Don't use the index when searching in file folders for system files". After checking the box, you should click on Apply and OK. Now onwards your computer will not use this feature. After completing this procedure your laptop will show a little more performance. However, in case if you want to look for a specific file on your laptop, you will see more time to find it by the OS. It is because there are no updates regarding the newer files to the OS index. So your laptop gets extra performance at the cost of slower file searching. If you have the habit of forgetting saved file locations, I recommend you to keep this feature active.